The audience was escorted into a black, industrial-looking room filled with objects that looked like they belonged to a mad scientist. At the forefront stood a cluttered desk with several books about body anatomy. And further back there was a bulletin board with different newspaper articles – including one about blood transfusion to make a person young again. The strange set-up was accompanied by pop music from a ghetto blaster. Turning towards the stage, the solo-performance dancer Anders Christiansen had already begun to form a doll with mud and was decorating it with hair. In the show ‘Another Body’, we are taken on a hunt for artificial life. It’s clearly inspired by Mary Shelly’s ‘Frankenstein’ and the Jewish folklore being ‘Golem’, in which mud and clay are used to make a human form that comes ‘alive’. The show took a turn when the barrier tape separating the audience from the stage was taken down. This gave the audience a chance to walk around and observe the play from new angles – a fun experience for the first couple of minutes. Christiansen continued his work on the lifeless figures – filling them with potatoes and sewing them back together – as the audience watched and moved around to get a better look. Walking around from one figure to the next, he picked one up and put it on a rolling table, steering it towards a dark corner. Maybe he was too focused on his next movement to notice the people in his way, but they suddenly had to jump for their lives to escape him, ‘the body’, or end up unexpectedly becoming part of the show. While it was fascinating to watch at the beginning, the show quickly turned dull as the slow movements lulled the audience into a trance and much of the performance was a sequence repeated over and over again. 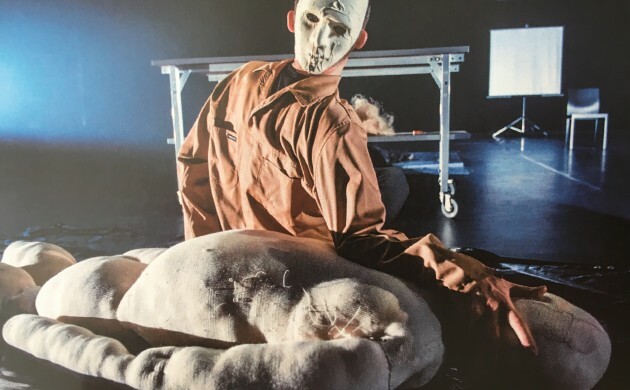 For the second half of the show Anders Christiansen wore a white mask on the back of his head, turned his clothes around so the front was at his back, and danced in front of the audience as if his head had actually turned all the way around – an impressive act. All in all, an experimental production with interesting elements – raising interesting questions about artificial life – but perhaps lacking the dynamic to keep the audience completely captivated.